Letter Reversals: Is it dyslexia or something else? When parents notice a child reversing letters, they often suspect that the child could potentially have dyslexia. Dyslexia is a language-based learning disability that causes difficulty with reading, writing, and spelling. Writing letters in reverse is one of the most well-known and recognizable signs that a child may have dyslexia. So when a child is experiencing difficulty learning to read and also reverses letters, it’s reasonable to speculate that dyslexia could be to blame. However, many parents and educators are unaware that letter reversals are also a common symptom of vision problems, such as eye movement disorders and visual processing deficiencies. 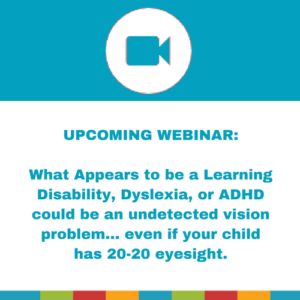 Click here to learn more about how vision problems interfere with learning. If you notice that your preschooler through first grader is reversing letters, there’s no reason to be concerned. When a child is learning to read and write, confusing left with right and writing letters backwards is a perfectly normal part of the early development process. But if you notice that your child is still reversing letters in second grade and beyond, it’s time for a proper evaluation — a comprehensive vision exam by a developmental optometrist who specializes in functional vision care and vision therapy. Typical vision screenings do not test for the learning-related vision problems that have similar symptoms to dyslexia. An exam by your family eye doctor usually only evaluates clarity of vision at a distance. So it is important to note that children with 20/20 eyesight may also have a vision disorder. In addition to reversing letters, children with learning-related vision problems face many of the same challenges as children with dyslexia. They may confuse left with right and transpose words, have messy handwriting, experience and experience difficulty with peripheral vision and depth perception. Many struggle with reading comprehension. Some also have trouble staying on task and paying attention. There are subtle differences between the symptoms of some vision disorders and dyslexia. Even a professional trained to recognize dyslexia may not suspect a vision deficiency without specific awareness. Whereas dyslexia is a lifelong learning disability that many people learn to cope with successfully, functional vision problems can be treated and overcome. 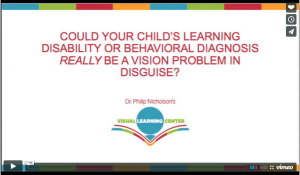 That’s why if you suspect dyslexia, it would be in your child’s best interest to rule out a functional vision problem that can be treated successfully with vision therapy. To be clear, vision therapy does not cure dyslexia, but learning-related vision deficiencies that have symptoms similar to dyslexia can be improved and even eliminated by vision therapy. Click here to learn more about this vision therapy activity. To schedule a comprehensive functional vision exam and to learn more about vision therapy in Olney Maryland or Silver Spring, Maryland, contact Dr. Philip Nicholson’s Visual Learning Center.